The Food Alphabet and More: A Japanese nightcap Izumi Sake Bar + GC giveaway! After a night of partying with friends on weekends, the best way to end the night is to chat away time with good friends, a great dining atmosphere and of course delectable and fulfilling food. 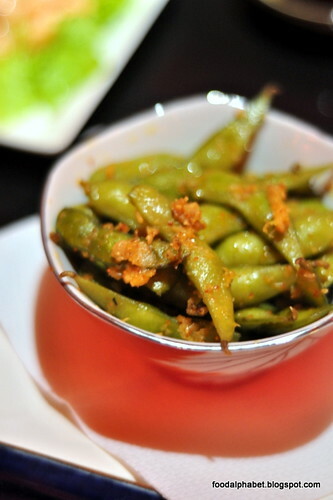 Izumi Sake bar is definitely the place you would want to be. Located in the busy Burgos Circle, it serves the people of cosmopolitan Metro Manila who comes to chill and have a good time. But moreover with Chef Him Uy de Baron, the new chef of Izumi Sake bar, who helms the kitchens of East Cafe in Makati and has Nomama, his own restaurant under his belt, comes a transformation that will take your taste buds to a new nightcap dining experience you will definitely be coming back to. Taste the many appetizers in small plates for bar dining, makes for perfect start to a fulfilling meal ahead. Here we have Soft Shell Crab Harumaki, Spicy Edemame (P165) and Salmon Poke (P180), healthy and fresh food prepared upon order. 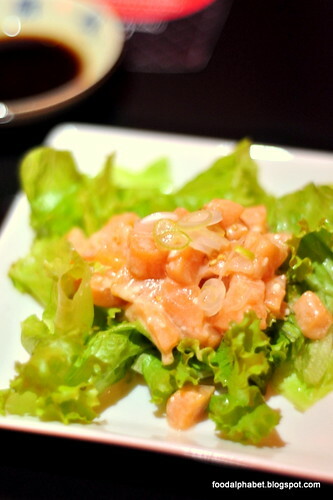 I especially loved the Salmon Poke, with coconut and fish sauce dressing, sweet and exquisite, even if I'm not a fan of salmon, this dish I will come back for more anytime. 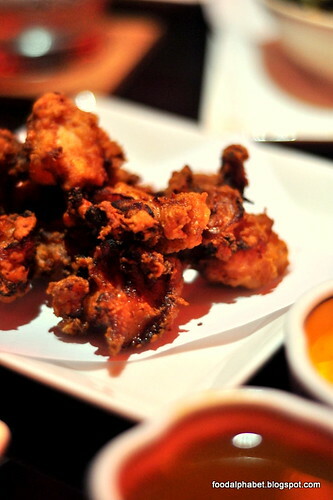 Tori Karaage (P185) - Chicken chops deep fried served with choices of ginger tamarind, rootbeer BBQ or Mandarin Glaze sauces. Soy Chicken and Mushroom Gyoza (P170) - a delicious filling of chicken and shitake mushrooms. 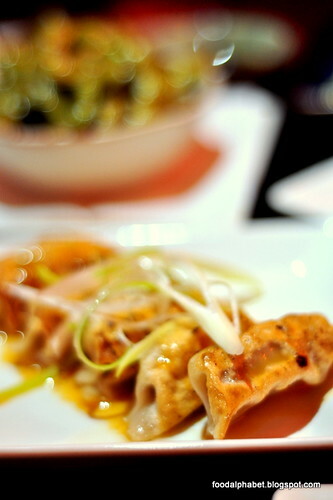 Loved the gyoza! 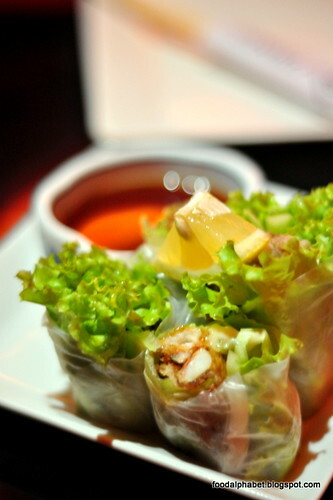 With its sauce infused, these great tasting babies is the gyoza you have long been looking for, taste it and find out. Maguro Izumiyaki (P220), if you love maguro sashimi, this you will die for. 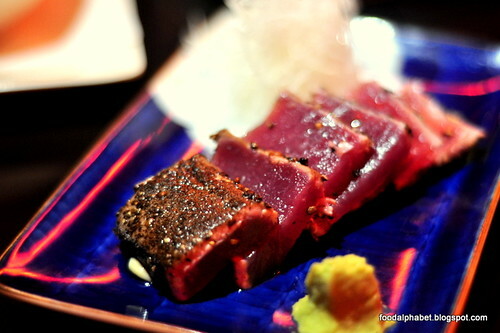 Take a bite of this crusted tuna seared and sliced, served with Japanese mayo. 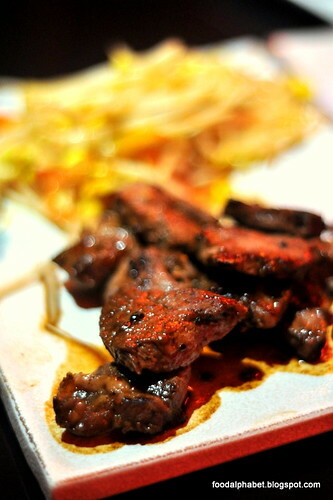 Take a liking into their Kitayama Sirloin (P460), with tender Kitayama beef marinated in light soy base, pan grilled according to your preference. Bite into these soft, tender sirloin beef and forget your diet. Want the beefy great taste but without the guilt? 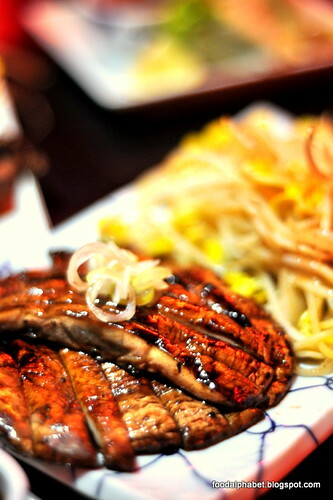 Then treat yourself and feast on these Portabello Mushroom steak (P390), mushrooms have never tasted so good, thank God for these Portabello mushrooms. 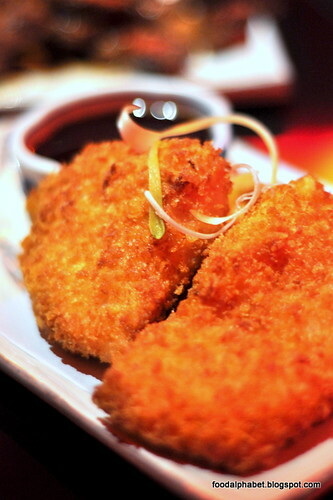 Have a craving for Tonkatsu? 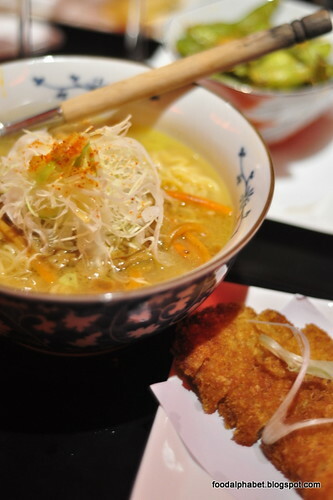 Dig yourself into Pork Tonkatsu (P170) and Fish Katsu (P140) also part on their hot mains. 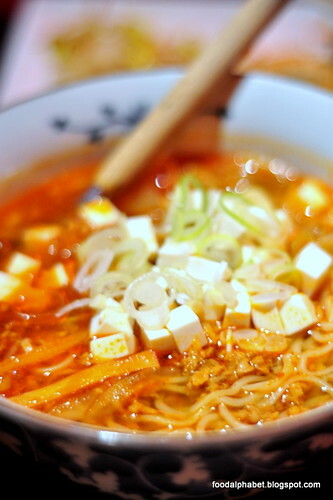 And to end the night with a bang, delight your taste buds with Curry Tonkatsu Ramen (P250 - medium) and Mapo Tofu Ramen (P230 - medium), with ramen as good as these, I wish they could serve this earlier, sad to say they only serve ramen starting 12 midnight. This is definitely a dining experience like no other. 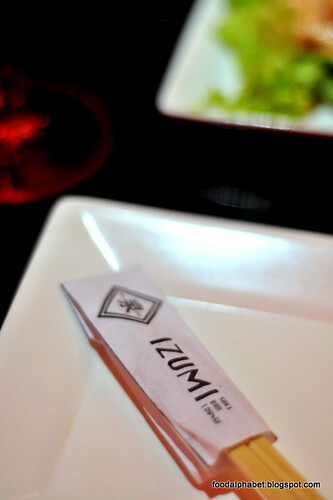 Like Izumi Sake Bar on Facebook and Follow them @IzumiSakeBar on Twitter.